Simple but lovely and bold is how I describe today's card. This is a card that can be given for a birthday, anniversary or job well done! In this case, it was for someone who joined my team recently. I simply took the large branch image and stamped it vertically on the side and then stamped and cut out the flower images. The bold red color matches the ribbon I tied in a knot and also the "Congratulations!" sentiment. DONE! Let me know if you have any questions about this card or any projects I've made. I am in the process of preparing to post about my Craft Studio remodel, so stay tuned! I great way to make sure you don't miss a post is to sign up to receive an email when I post. See the right side bar to sign up. 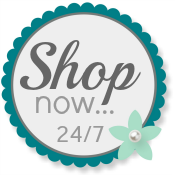 Please use my Online Store when you are ready to order Stampin' Up! products.